How Much Does Above Ground Pool Installation Cost? Above ground pool installation can be a suitable DIY project, but making use of a contractor will offer warranties and professional help. DIY projects offer much lower warranty terms than if it was installed by a pro. There are, however, a few benefits to above ground pools. Most new models come with the same features of an in-ground pool, just at a much lower cost, and with less maintenance. They are also safer for kids and pets because of the high side walls. Below we will discuss what influences the cost to install an above ground pool. How Much Will It Cost To Install an Above Ground Pool? 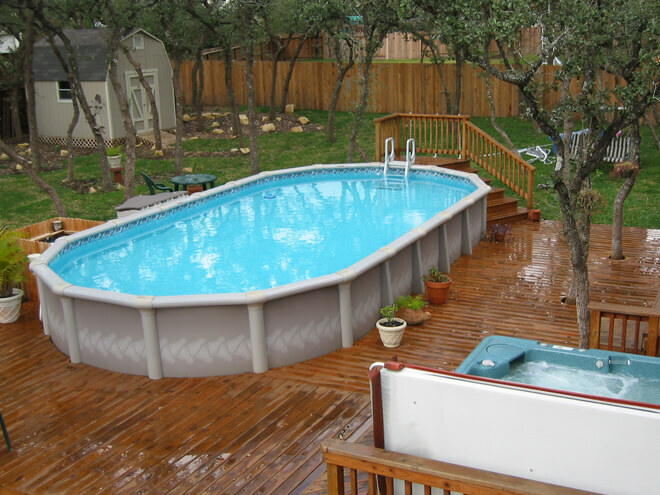 Local professionals will bring experience to your above ground pool installation project. With a knowledgeable contractor you will be able to get the job done right the first time. It's highly recommended to compare at least 3 quotes from reputable contractors before you make your final decision. This way you save money, and you get a price relevant to the trends in your specific region. The location of your pool installation has a major influence on the cost. Certain states may require construction approval from local authorities. They may also require taxes and fees for permits, which aren't included in the cost to install an above ground pool. The area where you want to place your pool will affect the price. Sometimes land and site clearing is needed, as well as boulders, shrub, tree, and stump removal. This generally costs $1-$1.50 per square foot depending on the distance for this removal and delivery of pool parts. The size of your above ground pool installation is one of the biggest cost influencing factors affecting your final bill. A bigger pool means a bigger price tag. It's important to remember the bigger your pool is, the higher your maintenance costs. The size of your pool is also influenced by how much free space you have in the yard. In addition to pool size, consider factors like the shape, and type of pool. Above ground pool shapes are limited to round, rectangular, and oval. Though this won't have a major influence on the final cost. Consider the type and thickness of the pool liner that you will install. Some are more durable than others, and will affect the cost. The requirements for pool fencing may differ from state to state, but generally, there is a height requirement of 4.5' to 5'. In addition to these extras, almost all pools will require cleaning tools such as brushes, nets, chemicals, and covers. These basic add-ons can easily cost $300, while adding more can push the price well into the thousands. On average, homeowners can expect to pay around $6,200 for an above ground pool installation. This should cover professional installation, a pump, filtration system, cleaning tools, and possibly a ladder. On the low end, if you opt for a DIY installation with minimal to no extras, you're looking at spending around $3,700 for a 19' wide circular pool. On the high end of the price spectrum, if you include a surrounding deck, all the cleaning tools, fences, and add-ons, you can expect to pay upwards of $8,300. Remember, if you decide to get in some professional help for your installation, several people may be willing to quote you, but this does not necessarily mean that they have the experience and know-how to actually complete the installation up to standard. Be sure to check references and view previous projects they may have been involved in to ensure you avoid being disappointed. Remember that estimates may vary from state to state, but if would like a localized estimate on the cost to install an above ground pool, you can do so now with the help of Homes Ace. And the best part - it's absolutely free with no obligations or any hidden cost to you whatsoever. To get your 100% FREE estimate from professionals in your area, simply enter your home zip code in the space provided on this page. We'll connect you with the very best contractors in your locale!